Blue Star Love ~ From an Amazing Heart of Grace. I bought this book because Maia is a dear friend and I wanted to support her efforts ~ however, upon receiving the book I realized quickly that I was holding a very unique gift in my hands. Maia has spent 28 years researching the contents of this book. Through its pages we get to know Elvis in a very expanded way ~ the true Being behind the public persona. 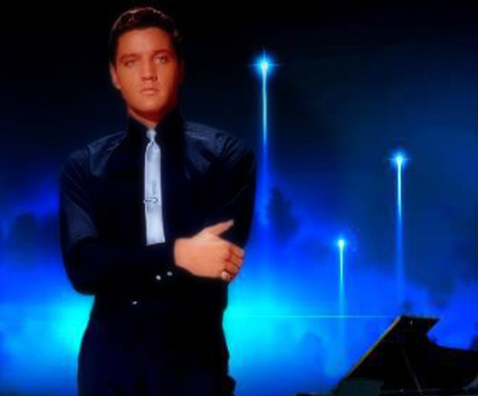 We discover that Elvis was very spiritually aware, remembered his Star Home, studied metaphysics with a passion and even taught important metaphysical concepts to any of his fans who were willing to listen. This is an unusual and extrordinary read, full of activations and remembrances. Indeed in the times that are upon us, this book is a comfort to all Star Seeds. Blue Star Love is one of the most amazing books you’ll ever read, and it’s not just about Elvis Presley. Author Maia Nartoomid provides astonishing documents as evidence as her foundation plus the insights she facilitates about higher consciousness, planetary & galactic history weaves together an eye-opening, page-turning read! Maia has performed an extraordinary service to the Elvis Presley legacy by compiling all these true stories & authenticated documents. Now others can truly understand why Elvis so touched their hearts! I discovered the Elvis Presley channel on Sirius Radio earlier this year & then I ‘just so happened’ to watch a Hulu.net special on Elvis before reading this book, so Spirit had already prepped me to be an Elvis admirer–something that I had sadly missed out on when younger. Blue Star Love is my true initiation into Elvis. On Thursday (March 6) after my morning meditation and that great call to guide my activity for the day, I found myself purchasing Maia’s Blue Star Lore from Balboa Press and began reading it to find out what the strong prompt was all about. Now let me share with you, I am not an Elvis fan, just a little too young to gravitate to him though I loved all the movies he starred in and the warmth in his voice. I talked with Maia over a year ago about this book and when I discovered it was about Elvis, my interest fell away. She encouraged me to read it nonetheless. I recall saying to Maia, that I would do so and that perhaps she could join me on air to discuss the book. Today, I followed up on that prompting without any idea in my head to do so. It just happened. I am sitting here as I write to you stunned by what I have read so far and equally stunned by the inspired action I feel arising within me to support Maia getting those other unpublished manuscripts out into the world, so that they might be published on her own terms. Maia you are a most radiant light in this world that sadly we are not fully capable of perceiving. May your legacy find a wondrous container that remains as a treasure trove for humanity as we make our way to the New Earth. OMG my book has arrived, was planning to book work tonight, but its sooooooooo good, I can’t put it down! While reading a book engaged on the “John” tragedy struck our Song King at the tender ……. “The Eye of Ra in ancient Egyptian mythology functions as a feminine counterpart to the sun god Ra The Eye is an extension of Ra’s power, equated with the disk of the sun, but it also behaves as an independent entity, which can be personified by a wide variety of Egyptian Goddesses, including Hathor, Sekhmet, Bastet, Wadjet and Mut. The Eye goddess acts as mother, sibling, consort, and daughter of the sun god. She is his partner in the creative cycle in which he begets the renewed form of himself that is born at dawn. The Eye’s violent aspect defends Ra against the agents of disorder that threaten his rule. This dangerous aspect of the Eye goddess is often represented by a lioness or by the uraeus, or cobra, a symbol of protection and royal authority. The Eye of Ra is similar to the Eye of Horus, which belongs to a different god, Horus, but represents many of the same concepts. The Eye of Ra was involved in many areas of ancient Egyptian religion including in the cults of the many Goddesses who are equated with it. Its life-giving power was celebrated in Temple rituals, and its dangerous aspect was invoked in the protection of the pharaoh of sacred places, and of ordinary people and their homes.